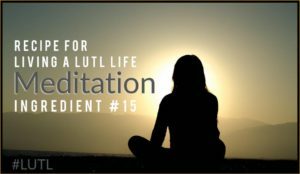 The 15th Ingredient for Living a ‪#‎LUTL‬ Life is “Meditation.” Quiet your mind for at least 10 minutes a day. Remember, meditation can be done in many ways. Find the way that feels good to you. We believe simply being in a state of appreciation is a great form of meditation. Sit somewhere that makes you feel good…a garden, beach or cozy chair. Take a few deep breaths and start the flow of appreciation for the gifts and blessings in your life. From the simple things in life to the dreams and goals you’ve achieved. This entry was posted in The Movement and tagged #LUTL, light up the love, meditation. Bookmark the permalink.